While sipping at Sip D'Vine in Multnomah Village on Valentine's Day, a packed house of listeners heard four professional actors perform devilish scripts about nightmare scenarios — a girlfriend meeting her boyfriend's mom, a royal marriage proposal in Scappoose and other fantastical stories. 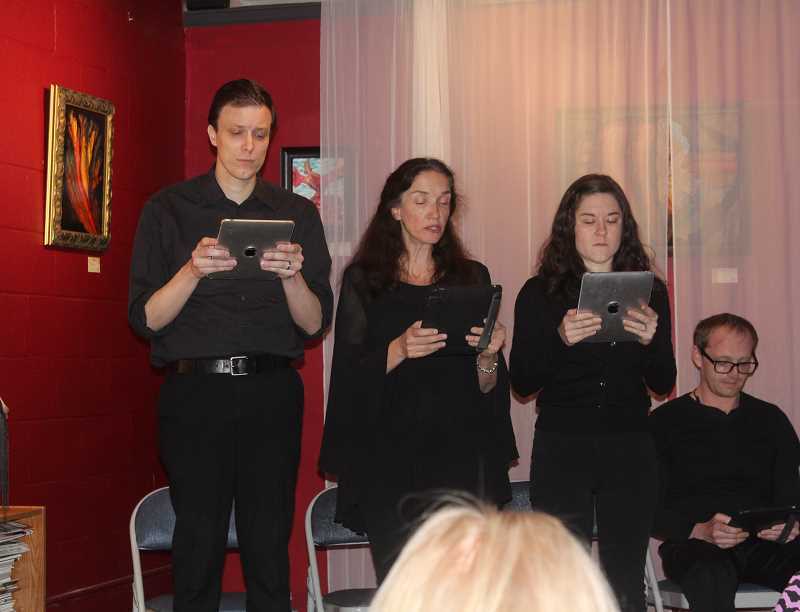 Every so often, one of the actors sat down or stood up and they all read from their iPads. Though the performance lacked much physical demonstration, the crowd laughed uproariously throughout. "The mission of the Pulp Stage is to offer easy tools for staging and savoring live theater. The savoring factor comes from the genres we choose," Artistic Director Matt Haynes said. "Just about every movie that's being released from Hollywood is probably science fiction, action or suspense. These are popular genres and genres that aren't far outside classical stage." When sifting through a bevy of stories either submitted or through a play exchange website, Haynes tries to choose scripts that feature life-or-death circumstances. He also sometimes tweaks scripts a bit to nix action scenes and replace them with dialogue. "Honestly, it's very tricky to write a good script that has the dramatic components where it seems like the characters are fighting something and really seems like it can grab a crowd in a bar from the beginning," Haynes said. Haynes also says the minimalist, portable format utilized by Pulp Stage could be useful for college students or actors trying to jumpstart their theater career. It's also good for actors with mobility issues or those who struggle with memorizing lines. "If you're a beginning theater company, here's a format you can do very easily. If you want to get something going, this really does work," Haynes said. "For actors between the ages of 17 and 23, you can get into a lot of the same monologues over and over again because there's so few that really work." Over the years, a large portion of Pulp Stage's performances have taken place in Multnomah Village — either at Sip D'Vine or O'Connor's Restaurant. "We just have great audiences in the Multnomah area. We just stick with a good thing there. It's really nice to be performing somewhere that's just around the corner from a lot of theater-enthusiast residents," Haynes said. Pulp Stage also offers "live storytelling karaoke," where actors can download stories online and read from home. "Once I started getting into live theater, I was hooked into the thrill of a group of people doing communal make believe. I don't think in terms of potency there's anything stronger," Haynes said. "What I've always wanted is to have our company give a third option to the mainstream entertainment, movies, television — a third option which is busting open something live in your living room."